Newspapers have long scrubbed their pages at Obama's request. Like that damaging gas quote from AP. Or the NYT and Obama's Chicago Olympics dream. I'm sure that most of them are very much unlike Winston from 1984 and enjoy scrubbing all unevents from the annals of Obama history. But, if there are any journalists wondering what happens if you don't play ball? 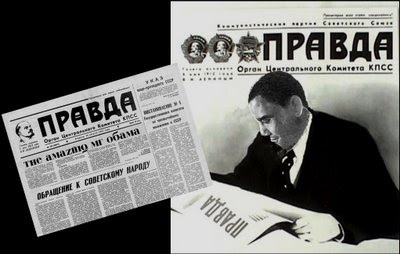 Obama to media: I can't be expected to create a US pravda myself. If you don't make yourselves into my propaganda machine, I'll cut you out. 'Fairly' - meaning on their knees with their mouths open. The White House Crony Press Office... place boot on neck of the Boston Herald!